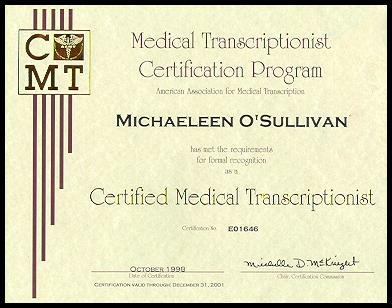 Become AAMT (American Association of Medical Transcription) Certified RMT (Registered Medical Transcriptionist) after successful completion of training. We will provide 100% assistance for registration with AAMT and will arrange RMT exam in Bangalore after meeting AAMT testing criteria. All the expenses for AAMT registration and examination will be born by candidates appearing for examination. After few years of experience, you can appear for CMT (certified medical transcriptionist) which is conducted by AAMT in India at AAMT-approved testing centers regularly. We have FREE online continuing education programs for CMT exam preperation for our students. Our top quality training program will faclitate our candidaets to prepare well for RMT examination after successful completion of training and CMT examination after few years of live job experience.